Yesterday’s afternoon, the French blog, Mediapart, published a stunning report, based on several weeks of investigation, that argues that racist ideas have become normalized, indeed banalized, at the highest levels of the French Football Federation. You can read an English version of the report here. And I have published a piece in reaction the article at Mediapart, which echoes and extends some of the reflections here. Mediapart reports that, at the end of 2010, several high-ranking members of the F.F.F. — including the current French national team coach, Laurent Blanc, a veteran of the 1998 World Cup campaign — agreed that it was desirable to decrease the numbers of “black” and “Arab” players in the national training academies. They sent out directives to various academies asking them to intervene — among trainees at the age of 12-13 — to effectively limit the number of players of these backgrounds. While many in France on the left and right have for years declaimed and feared the idea that “quotas” would be put in place in order to carry out what is tellingly called “positive discrimination” (i.e. affirmative action) to help diversify universities and other institutions, it seems the F.F.F. was quite literally discussing, and even starting to put into effect, a “quota” system aimed at making sure there was what they considered the appropriate number of “white” players, who seemed to have been deemed by some generally more tactically intelligent. Since I read this piece this afternoon, I’ve been stunned by the skid into delirium this represents. Perhaps I shouldn’t be surprised: after all, racist commentary about the French team has a long history, and reached a dangerous peak during the 2010 World Cup fiasco. (In late June of last year, for instance, a small crowd of protestors entered the F.F.F. headquarters, demanding that it create a team that was “white and Christian” by “firing” “blacks and Arabs“). And yet this is nothing short of a powerful form of treason — not only to the principles of equality that supposedly under-gird French political life, but to the principles of sport as well. That many young men who grow up in the French banlieue (suburbs), subject to economic marginalization and various forms of racial and cultural exclusion, have sought to use sport out of an otherwise highly constrained situation is of course logical enough. After all, it is at least ideally one place where social background and connections shouldn’t really matter: if you play well on the field, if you score goals, no one can claim you didn’t. The French state, meanwhile, has at times strongly supported sports programs in banlieue regions as a way of addressing social issues. And some recruiters for academies explicitly looked to such neighborhoods as they searched for talented young players. 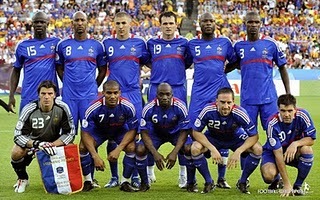 In the last decades, France has produced a string of legendary players: Zinedine Zidane, Thierry Henry, Lilian Thuram, Claude Makelele, Patrick Vieira, Patrice Evra, Florent Malouda, Lassana Diarra, Nicholas Anelka, Samir Nasri, and Karim Benzema — just to name the ones who have played at the pinnacle of the European professional game in England, Italy and Spain. All of these are French citizens, most born in France (though some arrived as young boys in the country with their parents), and have roots in the Caribbean or Africa (including North Africa). Their tactical and technical brilliance is widely recognized and cherished by a series of professional coaches. Many of these players contributed in crucial ways in winning France its only World Cup victory in 1998 — Thuram and Zidane respectively won the semi-final and final for France in that year. They led the team to a European Cup victory in 2000, and again to the final of the World Cup in 2006. So it is both nauseating and, frankly, just insane that the French Football Federation — rather than acknowledging and confronting it’s own sclerotic institutional culture, which has prevented any significant diversification of its administrative ranks — is now actually blaming “blacks” and “Arabs” for causing problems for French football. They have skidded into the realm of dangerous fantasy, deeply demeaning themselves and the sport they are supposed to represent. The news has spread quickly, and the official denials are — unsurprisingly — coming in as well. Laurent Blanc called Mediapart to deny that he ever made the comments attributed to him in the article. Other officials explain that the issue is that the F.F.F. has been frustrated by the number of players who, holding double nationality, have been trained in French academies but then played for teams outside France. (The Algerian team in 2010 included many such players). But the site insists its documentation on the topic is solid. They promise to publish more in the coming days, and one key question is what their sources are. The next days will surely bring us more accusations and counter-accusations; this is already ugly, and will likely get more so. There is no way to know for sure, right now, whether the accusations leveled in the article will all stand. My hunch, however, is that while the details and specifics will and should be debated, the broad indictment leveled in the article is probably correct. For years various powerful actors — including President Sarkozy — have contributed to the banalization and normalization of racist discourse, succeeding in making absurd and violent sentiments and statements acceptable, even a little chic. The fact that this has become true at the F.F.F. is, however, devastating precisely because, for so long, football actually was one of the rare sites that offered up a broad and popular alternative vision of what France could be — by showing what France actually is. While it is certainly likely that some of these discussions were driven by the issue of players of double-nationality, that would simply make this another site within French life where issues of immigration and naturalization are transformed — carelessly and with little attention to the reality on the ground — into excuses for racism. The large number of prominent players of Caribbean background, for instance, are not in a situation where they could claim double nationality and therefore play for another team. In a recent book, Achille Mbembe has argued that France today is struggling because — unlike its former colonies — it never actually went through its own process of decolonization. Today’s news makes that abundantly clear. Perhaps the exposure will force a real confrontation with the institutions that have allowed themselves to rot from within, and a call for true change. But that may be too much to hope for. With thanks to New Black Man and Duke University. Laurent Dubois is an academic at Duke University, Durham, North Carolina, USA.